You are browsing the Blog for Switchbox Archives - Omnispool. “Well now, I am impressed…and it takes a lot to impress me. Received the shipment and loaded, unloaded and reloaded fly lines for a solid hour…tried to beat it up – finds its flaws. Couldn’t. This system has everything! I can’t think of a darned thing to improve it. So nice to be appreciated. Thanks, Wayne. Enjoy your travels! Take a look at Vagabond Fly magazine online – reckon these guys have moved around with our gear and field tested it it more thoroughly than anyone… http://www.vagabondfly.com/omnispool-line-management-syste…/ Thanks for the good word, boys. Lines are open for orders, people! Comments Off on Omnispool Switchbox – Essential ! Thumbs up from Denmark… http://www.fin-chasers.com/#190 Thanks to the guys at Fin Chasers for that. Check out their e-mag – fine stuff. Those of you who haven’t seen the Omnispool range in Scandinavian outlets, they’re coming. Ask your local store to contact FlyFish Europe to get stock in for you. P lease be advised that effective immediately, distribution of the Omnispool range in UK and Europe as a whole and Scandinavia will be handled by FlyFish Europe AS. Through them our products will be more widely available to dealers in existing markets and also in several countries that they have not yet reached. We are excited by the prospect of much increased coverage. Please look for them at www.flyfisheurope.com to place your dealer orders. Pete Tyjas takes a look at an answer to his fly line storage problems. Over the years I have accumulated a lot of fly lines. Sometimes, when I buy a new one for trout fishing I take the now discarded line off of the reel and wind it on to the spool the new line came on kidding myself that there might come a time I’ll need it as a backup. I can’t think of many occasions, if any at all, when I have need the line I have saved. With the advent of a large variety of lines we use in salmon fishing now available as heads I am finding I accumulate a lot of them in a variety of densities and profiles. The large majority of lines are by Rio. They cover just about every eventuality I am going to face on the river and do the job perfectly but storing them is becoming more difficult especially since my wife, Emma, is now building up her own selection too. Let’s be honest. They aren’t cheap and so screwing them up or folding them up as best as I can and putting them in my reel case isn’t the best way of ensuring they have a long and hopefully distinguished life of service. I have known for a long time that I needed a better way of storing the heads but the cost of many storage systems I have seen have made me think that I may just as well replace a line instead. This is until I discovered the Omnispool Switchbox. First up it isn’t going to put a dent in the bank account at £9.99. It is well designed, in fact I’d go as far as saying it is one of the most cleverly put together fly fishing accessories I have come across. From the way the crank handle attaches to the easy way you can join the spool boxes together. It is really slick. It is simple to use, just wind the head or line from your reel straight on to the Omnispool. If you are changing a line hold the Omnispool between your feet and easily reload the line, it really is that simple. Although I have been mainly talking about salmon fishing when writing this piece I was reminded of a time I was saltwater fishing and whilst waiting for the flats boat to turn up I made a few blind casts into the surf and hooked a fish that disappeared off to the horizon cutting the fly line off on some coral. Thankfully I had a spare but I can see where the Omnispool would be useful as a way of keeping some spares for a trip that if you were in a similar position to the one I faced then it would be a really quick, simple change over. There is also a LineCarebox cleaner that attaches to the Switchbox that you just add line cleaner to that will clean your line as you reel it in for storage. 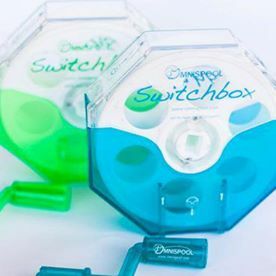 If like me you carry a variety of fly lines and want a cost effective, easy to use storage system you should give the Omnispool Switchbox serious consideration. It has made my life a whole lot more easier. Check out what some of the conventional guys are doing; pretty cool bit of improvisation: braid is also an expensive commodity and we’re told that after some use the guys turn it around on the reel. An Arbor Spacer’s a good place to start if you’re spooling hundreds of yards of string. We’re not sure we’d recommend power tools in combination with fishing line (! ), but we’re not going to try and stop anyone adapting our gear if it helps them out and makes them happy…just remember that these things are tough enough to handle everyday use, but if you overdo it with the power, it’s down to you if things get out of hand! Look, we won something! Our thanks to the folks at Fish Alaska magazine. Comments Off on We Won an Award!